There are two groups of settings that affect your staff's use of the Staff Portal. Settings that are applied to your database as a whole and affect ALL staff (See Staff Portal Settings). Step 4 of the Staff Portal Setup deals with the individual staff settings and gives you the option to set up or edit these settings for your staff in mass (as opposed to going to each Staff record > Portal Settings tab individually). Select the box(es) next to the staff name(s) whose Staff Portal Settings you want to setup or edit. Click the Check All button if the changes will apply to all staff listed. Use the Uncheck All button to reset. In the My Time Card Tab section make the selections for the settings that you want to change. If a setting does not need to be changed leave the drop-down as No Change. To view the staff person's current settings go to their Staff record > Portal Settings tab. These settings are covered in detail in the Time Clock section, under Staff Settings. In the Manage Classes Tab and Attendance Page sections make the selections for the settings that you want to change. If a setting does not need to be changed leave the drop-down as No Change. These settings are covered in detail in the Attendance section, under Attendance Settings. SAVE and click OK in the confirmation window. Note: At this point you can opt to leave the setup and continue at a later time if desired. Click GO TO STEP 5: STAFF PORTAL SETTINGS → to advance to the final setup step. 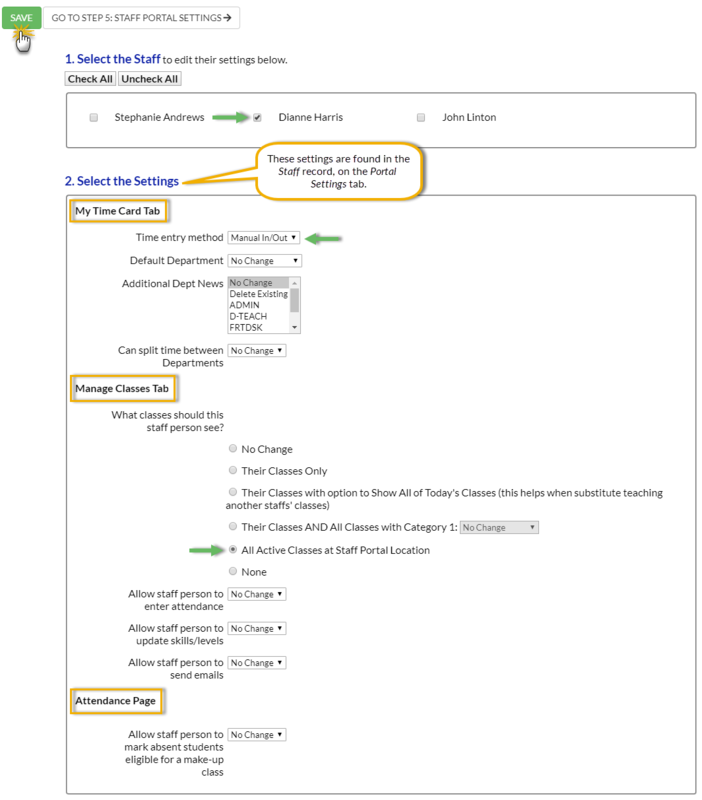 See Staff Portal Setup Step 5 - Customize Staff Portal Settings. 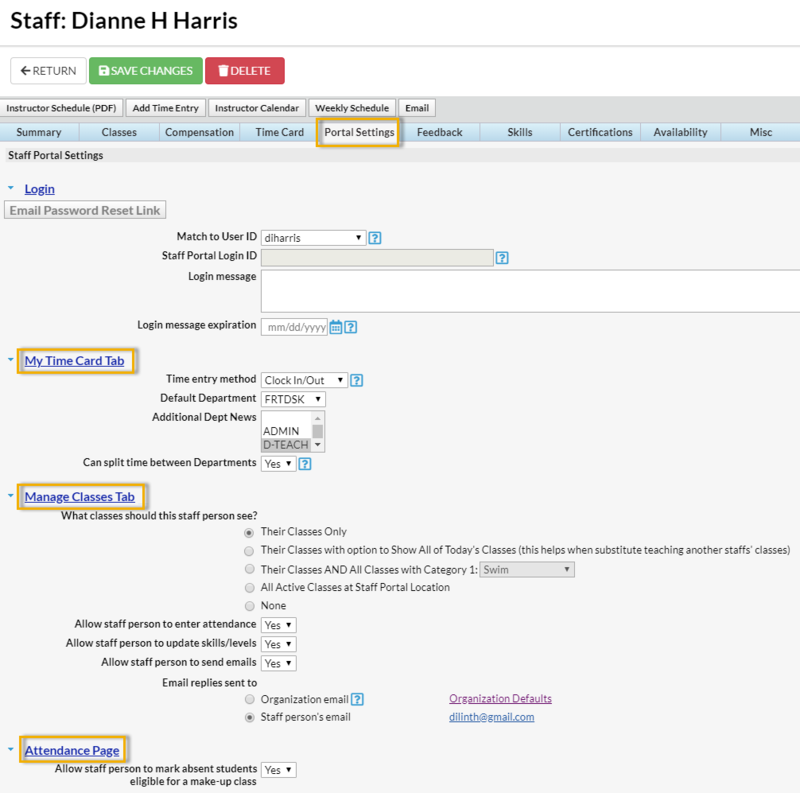 In the example below, Dianne Harris will have her Time entry method changed to Manual In/Out (from Clock In/Out - see above image) and the Manage Classes Tab will now show All Active Classes at Staff Portal Location (from Their Classes Only - see above image). All other settings will remain the same (No Change).